When you think about it, it’s a bit of a funny question. Can you imagine your first meeting with your bank manager and having him say: “Congratulations on opening your new restaurant. I hear you want a £15,000 overdraft. So tell me, how you are going to find new customers, keep those who have dined with you coming back and getting all of them to spend more each time they buy from you?” It sounds so easy to say, but is your answer strong enough to convince him to give you the overdraft? In fact, is it compelling enough to bet your financial future on? Without actually realising it, you already have. The good news is that there is nothing new about this. Big companies have been successfully doing this for years. Don’t believe me? Think about the last time you bought car insurance. Perhaps it started when you clicked a banner ad for “the lowest price car insurance – guaranteed” in a window next to your Hotmail account. All you have to do is register and they will send you a quote. As part of the registration process, they ask you for your car insurance’s renewal date. If you happened to make the purchase, the sales documentation is magically sent to you and financial transaction gets processed online. Then, about one month before it’s time to renew, you receive an email offering you a special deal because you’ve been a good customer. This deal may be something like insure both your cars and get 30% off or add your home to your policy and save 25%. It would be nice to think someone at the insurance company cared that much about you that they personally looked into your case and made these recommendations. Sadly, they don’t. It’s the computers in the back room that are doing all of this. And by “this” I mean, placing adverts in various channels with great promotions to attract you, implementing registration processes to keep you and offering you special deals to get you to spend more with them. Large companies in every industry invest millions in these kinds of systems. 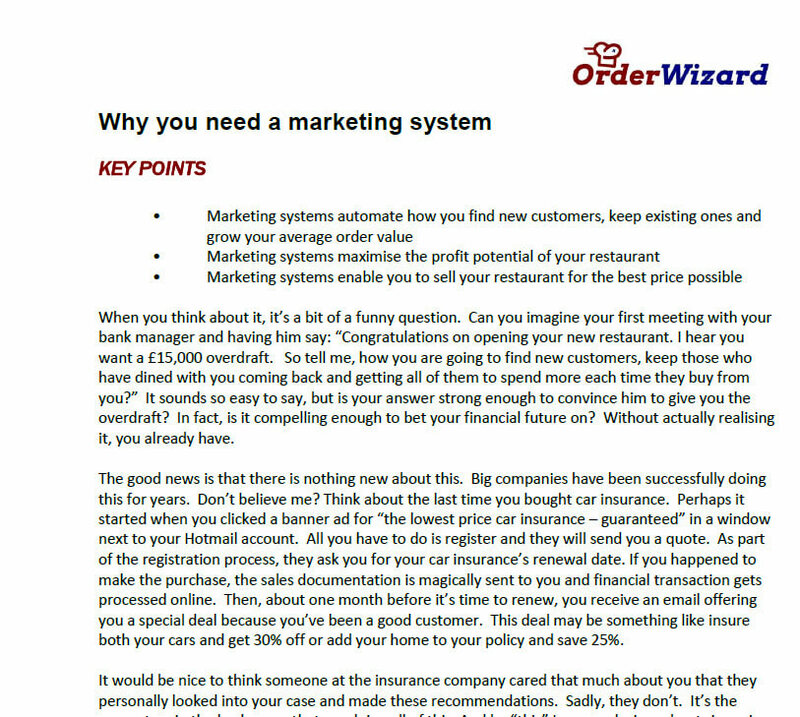 To compete in today’s restaurant market, you need to have a similar system working for you. In short, to succeed today, you need a marketing system that makes your new and current customers aware you exist and gives them a reason to buy from you tonight. That’s exactly what Order Wizard is designed to do. That’s why it’s the restaurant and takeaway marketing systems owners love most.